The guide called a day earlier to reconfirm and met us in hotel lobby on time. Nice and polite attitude. We skipped the night market since the weather was too hot. Seniors and kids couldn't stand after 3pm. Overall we are very satisfied with the tour. The only thing to minus 1 star because the Grand Palace was closed for the New King Ceremony rehearsal. Understand this is not controllable yet it was mentioned earlier by the authority. The office/guide should notice in advance. Anyway, the agent refund the balance of tickets smoothly without argument. Want to give 4.5 stars but no such function. So, 4 stars here. Still recommend you join this private tour. Get US$13.6 back in Klook credits for your next trip when you book this activity! Complete this Klook activity to get 5% of the activity cost back in free credits to use on your next booking. For example, book US$271.29 to get US$13.6 free credits. 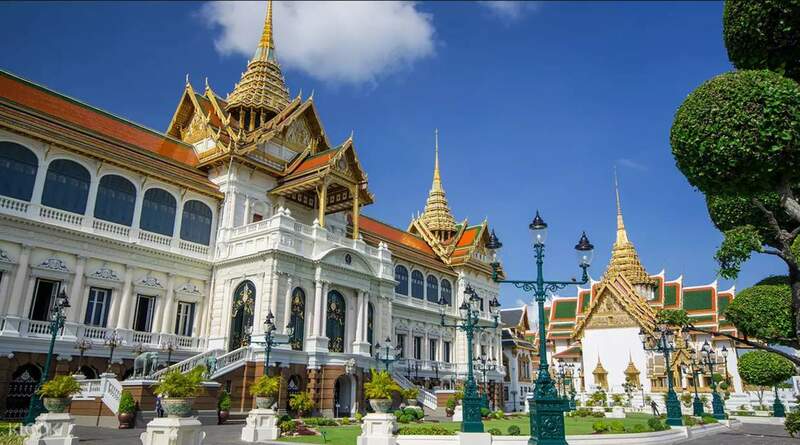 Luggage allowance: Maximum 2 participants and 1 luggage sized 24"
Luggage allowance: Maximum 5 participants OR 4 participants and 2 luggages sized 24"
Experience an exciting day adventure exploring Bangkok’s famous temples, natural sceneries and local spots. Hop inside the private air conditioned vehicles driven by professional drivers and kick start your day tour! 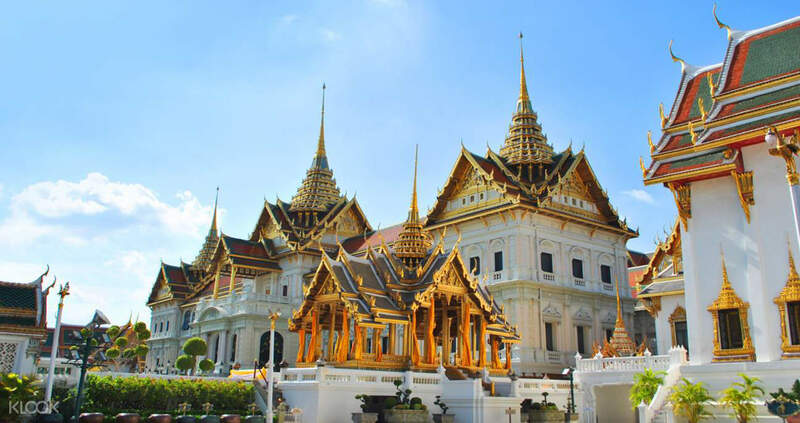 Take a trip to the Grand Palace and Wat Phra Kaew (Temple of the Emerald Buddha) to see the architectural prowess of the temples at the heart of the city. 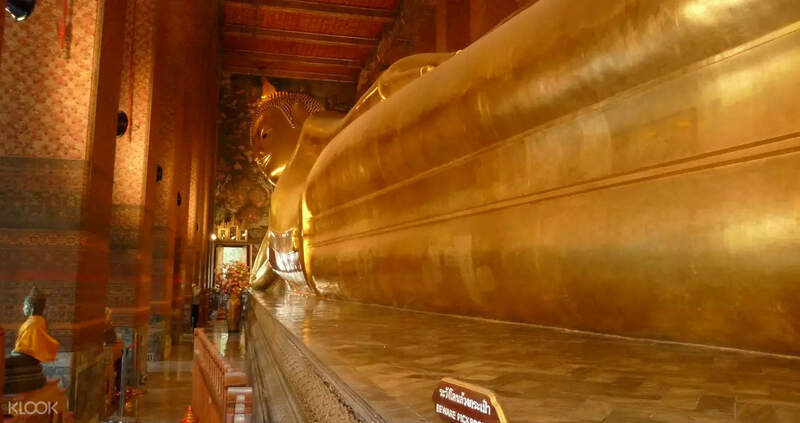 Visit Wat Pho and witness the 46 meter gold plated reclining Buddha, boasting to be the oldest and largest temple in Bangkok. 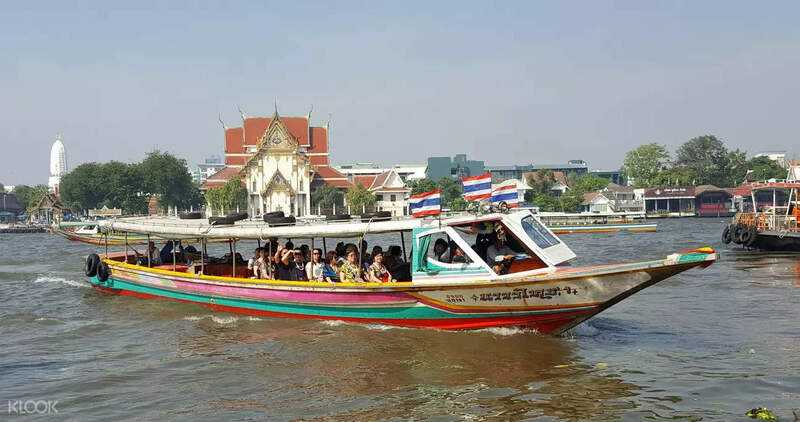 Board the long tail boat and go sightseeing along Chao Phraya River. Have the chance to go shopping at the Ratchada Train Night Market and find good bargains like a true Thai local. Have a hassle free fun filled day tour with hotel transfer services available in the packages! The guide called a day earlier to reconfirm and met us in hotel lobby on time. Nice and polite attitude. We skipped the night market since the weather was too hot. Seniors and kids couldn't stand after 3pm. Overall we are very satisfied with the tour. The only thing to minus 1 star because the Grand Palace was closed for the New King Ceremony rehearsal. Understand this is not controllable yet it was mentioned earlier by the authority. The office/guide should notice in advance. Anyway, the agent refund the balance of tickets smoothly without argument. Want to give 4.5 stars but no such function. So, 4 stars here. Still recommend you join this private tour. The guide called a day earlier to reconfirm and met us in hotel lobby on time. Nice and polite attitude. We skipped the night market since the weather was too hot. Seniors and kids couldn't stand after 3pm. Overall we are very satisfied with the tour. The only thing to minus 1 star because the Grand Palace was closed for the New King Ceremony rehearsal. Understand this is not controllable yet it was mentioned earlier by the authority. The office/guide should notice in advance. Anyway, the agent refund the balance of tickets smoothly without argument. Want to give 4.5 stars but no such function. So, 4 stars here. Still recommend you join this private tour. Make sure you bring umbrella/cap when you tour temples since it’s so hot and you can’t wear shots. Ratchada Night Market was the best part of the tour. We didn’t take the ride back home. Grace our tour guide was the best. Make sure you bring umbrella/cap when you tour temples since it’s so hot and you can’t wear shots. Ratchada Night Market was the best part of the tour. We didn’t take the ride back home. Grace our tour guide was the best. Guide Farr was fantastic! He contacted us the night before with clear instructions about dress code.. and was very patient and helpful with us as we are a family of 7 w elderly and kids.. the mini bus driver was also very fast and prompt.. overall the tour was great and informative despite the fact that the grand palace n temple was super crowded with tourists all over the world (as expected).. just be aware of the stringent dress code to enter the premises.. long pants is a must no matter your gender, otherwise ladies are alright to wear long skirts too.. singlets or see-thru tops are not allowed too.. Wat Pho is also amazing with the huge sleeping Buddha.. a sight to behold too.. suggest to take the Chao Phraya cruise between 4-6pm as it is not that warm.. the night market was also good.. we tasted fantastic rock-salt charcoal grilled sea bass and definitely an experience to remember eating in a night market.. overall a very good experience and a good initiation to Thailand if you have never been here.. Guide Farr was fantastic! He contacted us the night before with clear instructions about dress code.. and was very patient and helpful with us as we are a family of 7 w elderly and kids.. the mini bus driver was also very fast and prompt.. overall the tour was great and informative despite the fact that the grand palace n temple was super crowded with tourists all over the world (as expected).. just be aware of the stringent dress code to enter the premises.. long pants is a must no matter your gender, otherwise ladies are alright to wear long skirts too.. singlets or see-thru tops are not allowed too.. Wat Pho is also amazing with the huge sleeping Buddha.. a sight to behold too.. suggest to take the Chao Phraya cruise between 4-6pm as it is not that warm.. the night market was also good.. we tasted fantastic rock-salt charcoal grilled sea bass and definitely an experience to remember eating in a night market.. overall a very good experience and a good initiation to Thailand if you have never been here.. Very happy with this tour. Our tour guide Song did a wonderful job. He took us around and gave us the details of each place. He even helped us take many photos of our group and some he took using his own phone. He later send the photos to me by WhatsApp. Thank you and we really enjoyed it. Very happy with this tour. Our tour guide Song did a wonderful job. He took us around and gave us the details of each place. He even helped us take many photos of our group and some he took using his own phone. He later send the photos to me by WhatsApp. Thank you and we really enjoyed it. Our tour guide for this private tour was punctual and spoke simple english. she was friendly and also very helpful to take family photos for us. Overall tour experience is good and value for money. Our tour guide for this private tour was punctual and spoke simple english. she was friendly and also very helpful to take family photos for us. Overall tour experience is good and value for money. We originally book 10pax tour and decided to add 2 pax more on the day of the tour and paid 3k baht additionl. The tour was ok but we were told that grand palace was close due to public holiday, it was unfortunate. We ask our tour guide if we can have a refund on the ticket which is around 400- 500 baht per person and they say it was on process. It will be great if we successfully get the refund. We originally book 10pax tour and decided to add 2 pax more on the day of the tour and paid 3k baht additionl. The tour was ok but we were told that grand palace was close due to public holiday, it was unfortunate. We ask our tour guide if we can have a refund on the ticket which is around 400- 500 baht per person and they say it was on process. It will be great if we successfully get the refund. The driver arrived on time. Although the voucher didn’t specify he would follow us, he showed us the way and brought us around. Can speak little English but can understand what he meant. The shows actually quite disappointing. The orang utan show with a bit adult content not really suitable for kids. Only one tats good is the dolphin show。 and feeding the giraffe is the highlight. The driver arrived on time. Although the voucher didn’t specify he would follow us, he showed us the way and brought us around. Can speak little English but can understand what he meant. The shows actually quite disappointing. The orang utan show with a bit adult content not really suitable for kids. Only one tats good is the dolphin show。 and feeding the giraffe is the highlight. Our guide was very helpful. Enjoyed the sights as well. Thumbs up! Our guide was very helpful. Enjoyed the sights as well. Thumbs up!